In his ABC New piece on John Beckett's company, Peter Jennings summarized the story by saying, "They are using the Bible as a guide to business." 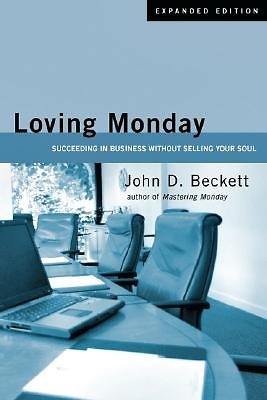 In Loving Monday Beckett fleshes out this theme, explaning how his company still uses the same truths that have guided individuals and civilations for centuries. He shows how these time-tested truths can be applied faithfully and successfully in today's fast-paced, high-tech, market-driven world. Beckett brings all of life together: work, belief, value, character, relationship, truth, worship and joy. The result is employees who feel valued, enjoy their work, work hard and are successful at what they do. Here is a book for everyone who wants to succeed in business without selling out. Includes study guide and a new afterword.